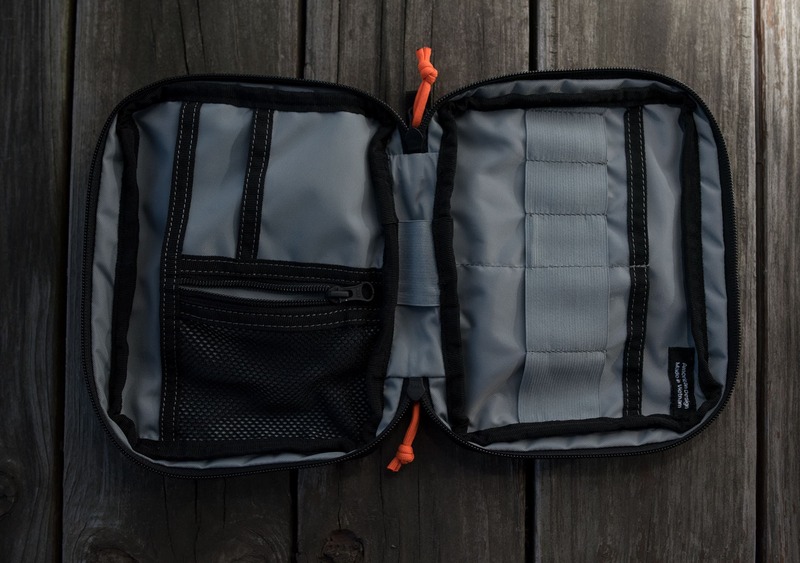 We love organization over here at Pack Hacker, so we’re psyched to be reviewing the Bond Travel Gear ESCAPADE Small Gear Pouch. Wow, that is a mouthful. Let’s just call it The Escapade, yeah? The Escapade is a… Well, it’s a small gear pouch—pretty self-explanatory. It’s made for holding some basic travel essentials, but like many bags in this category, you can find a ton of other use cases for it. We have found that the Escapade really excels with cord organization, so this might be a good pouch for some of your electronic gear. Anyway, let’s get into this review because we’ve got a lot to cover! 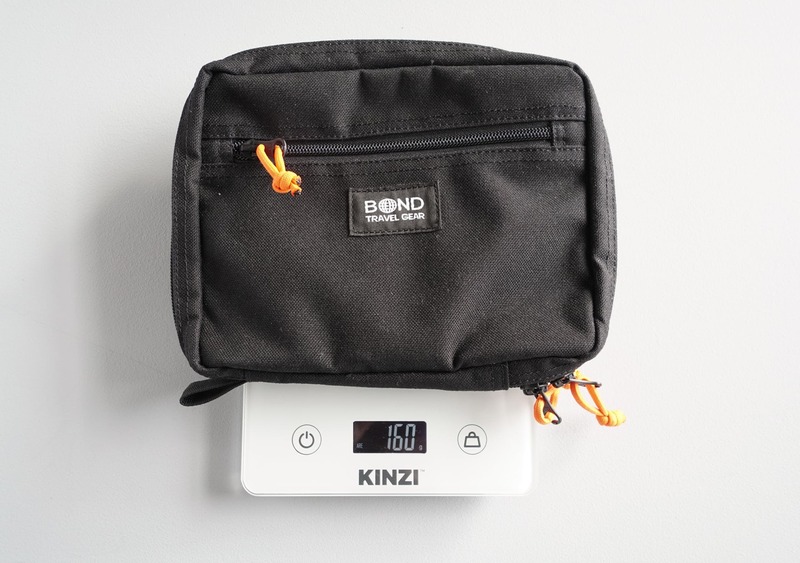 At the time of this review, you can find this gear pouch for about $40 on Amazon and Bond’s website. Kind of middle of the road price when it comes to these pouches—you can spend a lot on a high-quality pouch or go for a cheap little pouch. This is sort of a hybrid of both. The Escapade comes off as a pretty rugged piece of gear. The pouch has a clamshell design, so when unzipped it can open fully and lay flat, giving you easy access to all of the pockets and goodies. When closed it can get pretty bulky, depending on what you’ve got inside. There are a total of seven pockets—one on the outside—and five elastic “holsters” that can keep cords, tools, or writing utensils in place. It’s all black and made of 1000 denier ballistic nylon (this stuff is thick), with some heavy stitching in the corners and on various stress points. The ballistic nylon is water and abrasion resistant, plus Bond has added a coat of DWR for increased water resistance. There is a layer of DWR on both the interior and exterior fabrics, plus a double coating of DWR on the backside of the pouch. This significantly increases the weatherproofing, durability and qualifies the Escapade as one of the most rugged small gear pouches we have tested yet. It’s got #5 YKK zippers, which is essentially a medium weight metal zipper. Great quality zippers, but they are not waterproof or water-resistant. With all the DWR on the fabric, the pouch should hold up well to the elements, but the zippers are definitely a weak point when it comes to water resistance. Speaking of the outside, let’s just take a look at this thing for a minute. It’s sort of got the tacticool look going on, which works. The backside of the pouch is bare and it seems like it could really benefit from some MOLLE. Not only would it complete the tacticool look, but it could offer some great functionality for attaching to MOLLE compatible backpacks (to the inside or outside). 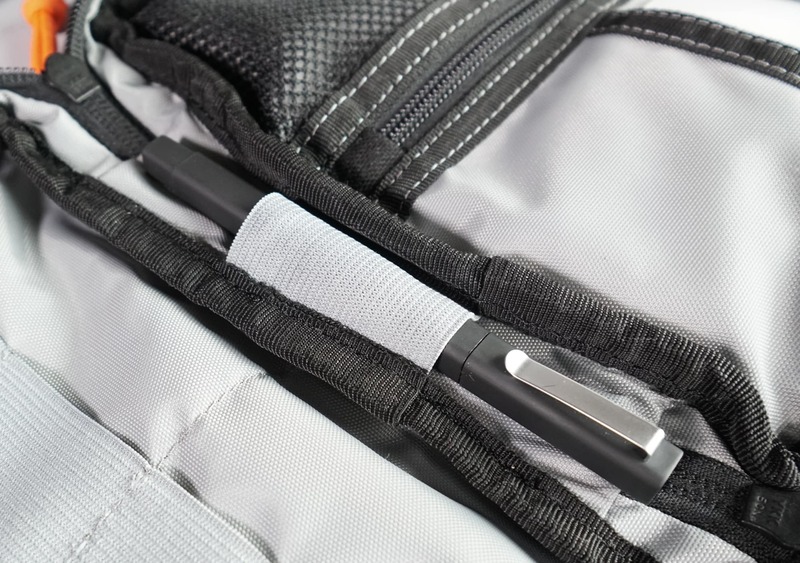 We’re always up for a nice jet-black ballistic nylon bag—but what is going on with these zipper handles? Blaze orange was a pretty bold choice. Sure, blaze orange is easy to spot inside of a black bag, but feels a little out of place on this. 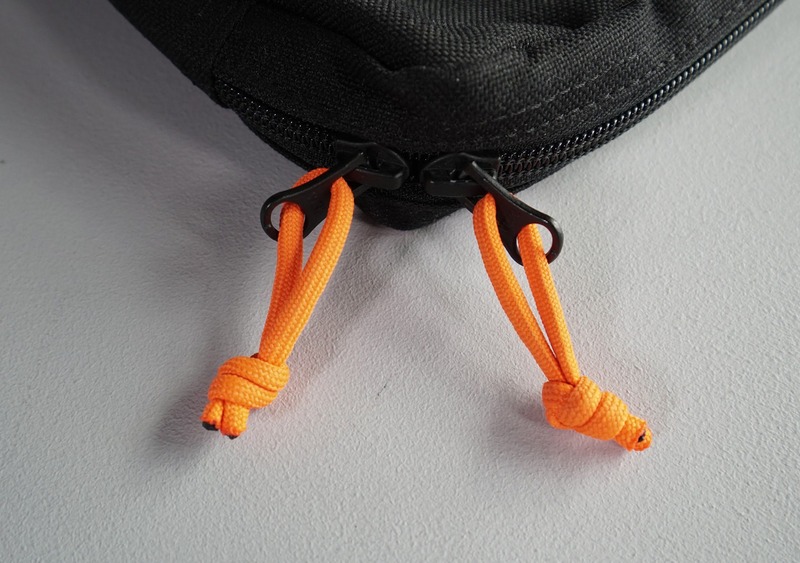 The good news is you can easily cut these things off and throw on some paracord of your own—but hey, if blaze orange is your thing, you’ll love it. The other thing we noticed right off the bat is the logo. The globe design just screams, “80s James Bond villain” to us, which doesn’t really portray the ruggedness of this pouch. Was this on purpose to coincide with the “Bond” name? We may never know… It looks like the mark that would appear on the loading screen as the villain charges his mega weapon that will destroy the moon or something. But at the end of the day, that’s just our opinion. And while we love branding and logos, we recognize that most people probably don’t really care. Now that we’ve gotten that out of the way, we can get back to the actual review. So there is a nice little pocket on the outside of the pouch that can give you easy access to a few small items. On their website, they show the pouch being used as a “long flight survival kit,” and they toss some snacks into the outside pocket. 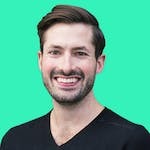 That is a great use for this one—just a few things you want quick access to. It’s pretty small. There is also the loop that we mentioned earlier. 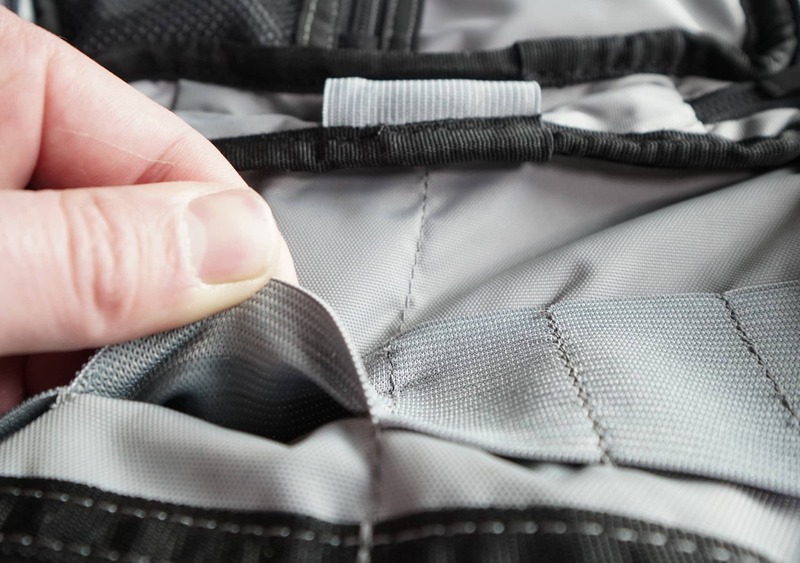 It’s a small double stitched loop that is super sturdy and useful for attaching to a backpack—or something else, we haven’t really figured out what, though. Throw a carabiner on there and the world is your oyster. Okay, time to open this thing up. With the clamshell design, you can really open this thing up and spread it out for easy access to all of the nooks and crannies. We love this aspect because it makes everything a lot easier to organize and pack. So we’ll start out with our favorite section—the elastic holsters! Why is this our favorite section? Well, a lot of bags have these—those little elastic bands that can hold pens, pencils, wrapped up cords, earbuds… You know what we’re talking about. What makes these ones special is this little rubber grip material on the inside of the elastic bands. This holds pretty much anything in place so you don’t have to worry about opening up your once perfectly organized bag to see a jumble of wires and pens everywhere. Seriously, we love this feature. It is so smart, it’s one of those little quality-of-life features that just makes a huge difference. Props to the crew at Bond for coming up with this, we’d love to see this become more common with other bags. So in this section, there are two half-sized pockets and five total holsters—one side has three, the other has two. We’ve been utilizing this area almost entirely for charging cables, dongles, and headphones. If it’s got a cable, we’re keeping it in here. But you could definitely use this for pens, pencils, a travel toothbrush—you get the idea. The good news is that even small items should stay in place pretty well due to those little rubber grips. As far as the two half-sized pockets go, these are the perfect size for a few travel essentials—passport, wallet, phone, etc. You could also use them for charging bricks or some small toiletries—floss, chapstick, nail clippers, etc. You’ll want to avoid bulkier items in here, there’s not much room to play around with and the pockets don’t stretch. We kind of wish there was some elasticity with the top of these pockets so that things stayed inside more easily. Depending on what you put in the pockets, you have to be pretty careful closing the pouch up to make sure nothing falls out. Seems like some elastic at the top would solve this problem, but hey—we don’t design these things, we just use them. We’ll just drop that into the metaphorical suggestion box and leave it up to the makers. Just a quick tip before we move on to the other side of the pouch—there is a small elastic loop on the “hinge,” between the two sides. We’ve found this fits a pen perfectly. This is a great way to store a pen or pencil without taking up one of those coveted holsters. The other side of the pouch has a mesh zippered pocket (YKK) on one half and a regular pocket next to it. The mesh is great because it lets you see what’s in there. This is a perfect spot for some batteries, a thumb drive, maybe some of those toiletries we mentioned above. The YKK zipper is pretty beefy—almost too much for an interior pocket—but you can be confident there won’t be any durability issues. The pocket next to it is only a few inches deep, so it’s kind of an awkward size. However, we’ve found that an Apple Magic Mouse fits in here perfectly. This is a pretty slim mouse though, so you might have trouble fitting in anything bulkier. Behind these two is the biggest pocket yet. It’s the full length and width of the pouch, and is the perfect size for a standard Kindle. It will easily fit any of the regular kindles, but once you start getting into the Kindle Fire tablets we can’t guarantee anything. If you don’t have a Kindle or you just hate reading, this is a great spot for some extra dongles, an external hard drive, a bulky wallet—you’ve got a lot of options here so we’ll let you decide. Keep in mind that you aren’t going to want to put anything super bulky in here as it might cause problems when closing the pouch. It’ll also turn this thing into a nice football shape, which is never desirable. So now that we’ve gotten through all the specifics, let’s just take a look at this pouch as a whole. We’ve already laid out some grievances, but there is a major one we have yet to address. The overall construction and manufacturing is just… sloppy. For some reason, this pouch just doesn’t have that clean, well-crafted look. There are no clean lines, a lot of the stitching and pockets are crooked, and there seems to be an unnecessary amount of material. Around the interior of the pouch, there is this band of webbing that detracts from the overall look. Perhaps it increases durability, but at what cost? This thing is already pretty durable. Near that “hinge” in the middle of the pouch, the stitching and webbing don’t even line up. It’s crooked. The corner stitching also has an excess of overlapped and folded fabric. We’re always looking for nice, defined lines and a clean look that can only come from superior craftsmanship. We’re disappointed to say that this pouch just doesn’t seem to have it. Now, with all that being said, the layout of this thing is fantastic. We really think that the layout of these pockets is just ingenious. It’s super ergonomic, it lets you store a ton of stuff in a really nice, organized way. The little rubber grips add a nice touch that we have yet to see on any other bags. They clearly put a lot of thought into the layout of this pouch, and it shows. We just wish the craftsmanship held up to the smart thinking that went into it. 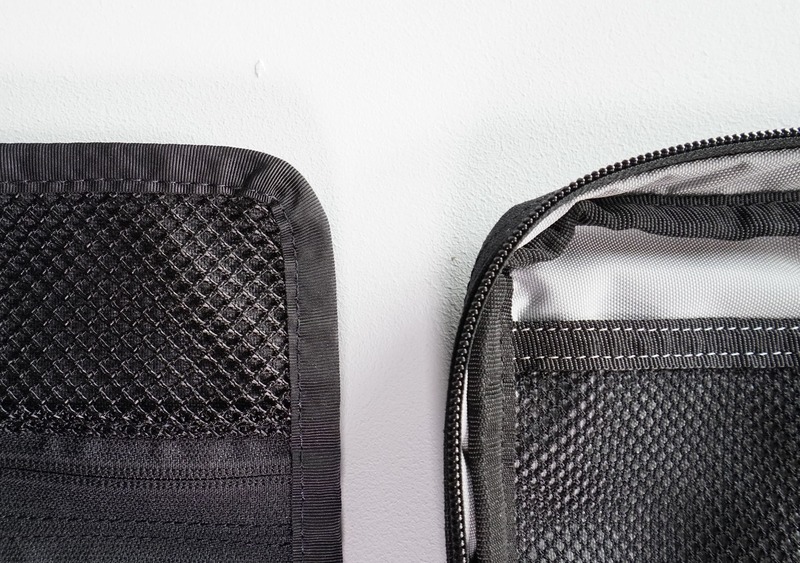 So, to recap—we love the durability, the rubber grips, and the layout of this pouch. We don’t like the craftsmanship, the orange handles, and the logo. Plus, there are a few areas that we think could use some minor improvements. Overall, this is a good pouch and it should suit you well. But we like to nit-pick and we’re pretty particular with this stuff. If you’re like us, you might want to pass on this one. Working as intended, craftsmanship is a little sloppy. Still holding up as intended. We don’t foresee many durability issues with this pouch. The rubber gripped holsters are amazing. We’re not thrilled with the overall look. Several areas that could use minor improvements. 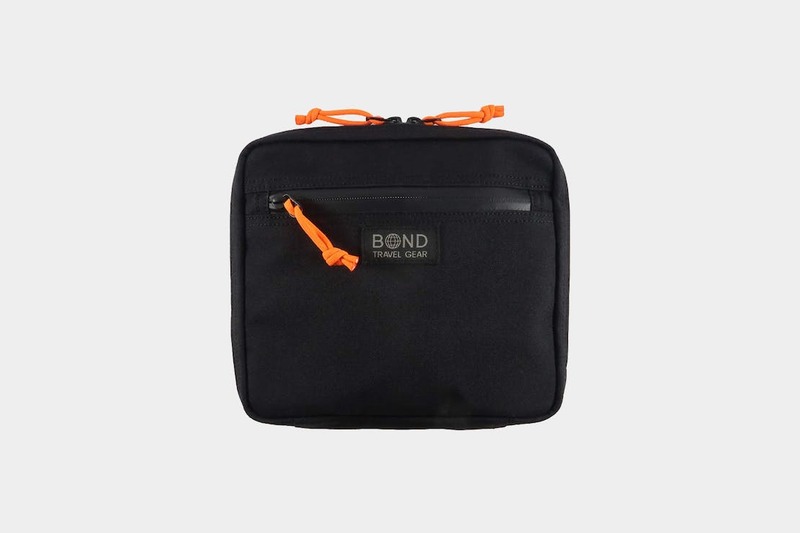 The Bond Travel Gear Escapade is a medium sized travel pouch that offers a ton of organization and storage. 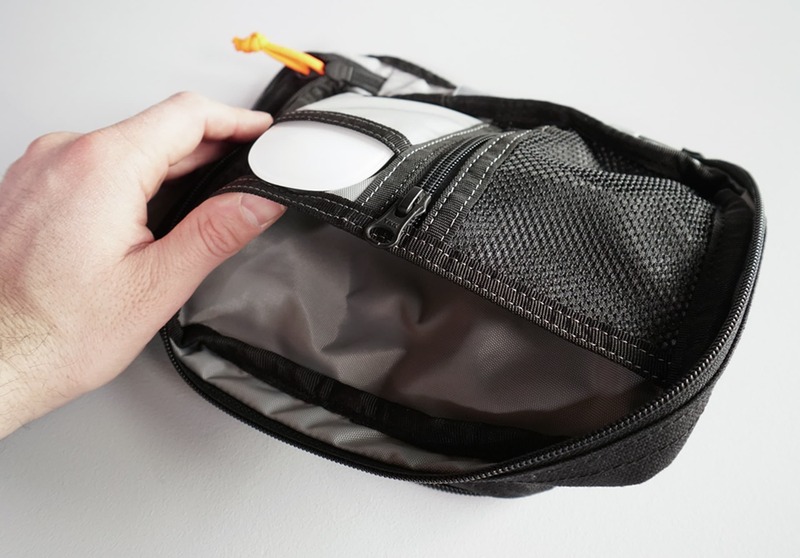 Perfect for a long flight, this pouch can hold all your travel essentials and then some. Although we love the layout, the manufacturing leaves a lot to be desired. Sloppy lines and excess material makes for a pouch that lacks those clean lines we all desire. The general look and logo are also not quite in line with what we’d like to see. That being said, it gets the job done and it is a very durable piece of gear. If you can get by some of our grievances, this is a perfectly capable and versatile pouch.